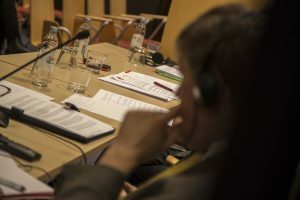 The WG was relaunched in 2012 and is currently actively supported by the following ENoP members: Swedish International Liberal Centre (Sweden), RES Publica (Portugal), CEVRO/Liberálně-konzervativní akademie (The Czech Republic), Konrad-Adenauer-Stiftung (Germany), Constantinos Karamanlis Institute for Democracy (Greece), Friedrich Naumann Stiftung für die Freiheit (Germany), Heinrich-Böll-Stiftung (Germany), Friedrich-Ebert- Stiftung (FES), Hanns-Seidel-Stiftung (Germany), D66 (Netherlands), Fondation Jean-Jaurès (France), Liberales (Belgium), Fondazzjoni IDEAT (Malta), Institutum Novum (Slovenia), KIC/Christian Democratic International Center (Sweden). Support to democratisation processes is a key component of the work of political foundations worldwide. In addition to the vast field experience ENoP members from Western Europe bring to the table, ENoP members from Eastern Europe provide their own and personal transition experiences. In this very unique capacity, ENoP accompanies the new developments around EU initiatives for a more effective democracy support agenda. In 2009 the EU has published its Council Conclusions “Democracy building in EU external relations” and set up the “EU Agenda for Action on Democracy Support in EU External Relations”. The WG is following the implementation of the action plan and keeps track of the EU’s actions in the field of democracy support. The WG has engaged in a constructive dialogue with the European Union on the question of how to further develop EU policies with regards to the support for political actors. The WG is furthermore giving input to public consultations, e.g. on the programming of the new European Instrument for Democracy and Human Rights” (EIDHR) 2014-2020.